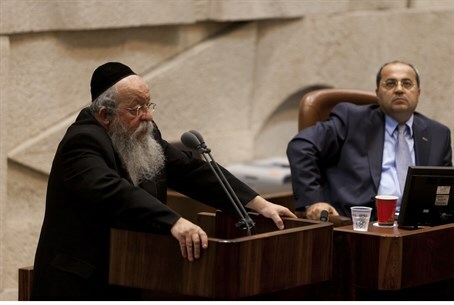 The Attorney General’s support for a redo of the Beit Shemesh municipal elections shows clear bias, MK Menachem Moses of the hareidi-religious Yahadut Hatorah (United Torah Judaism) party accused Tuesday in a speech to Knesset. Comparing Beit Shemesh to Nazareth shows that authorities are discriminating, he argued. “Why? Because he’s a hareidi mayor! That’s the only reason!” Moses accused. A group of as many as eight hareidi men in Beit Shemesh are accused of having planned to use roughly 200 fake identity cards to cast fraudulent votes on elections day. Police arrested the group, but suspect that some of the cards may have been used. There have also been accusations in the media of other elections fraud, including the destruction of hundreds of ballots cast for rival candidate Eli Cohen. Attorney General Weinstein rushed to call for reelections before police had finished their investigation into alleged voting irregularities in Beit Shemesh, Moses charged. “It’s reminiscent of the story of [hareidi men] spitting on a seven-year-old girl – something that never happened, a fact that didn’t stop the creation of an anti-hareidi media campaign,” he said. “Police closed the case, but the incitement has left its mark,” he concluded.